Log into your GoEmerchant Online Store Manager. The menu links section creates and modifies pages on the store's main navigation menu. The look and layout of your main menu is dependent on the template you are using, but most templates will have the menu located on the top. Click "Add a New Link"
Select from the drop down if it is a new main page or a secondary page to an already existing menu page. Sorting determines what order the page will be in the main menu. Lower numbers display first. Make sure the sorting order does not conflict with another page. 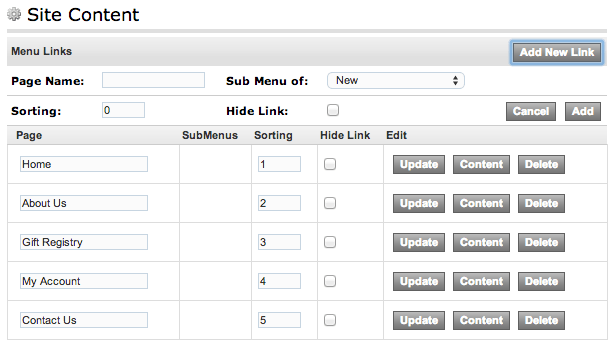 Click Submit, to create and add the page to the Menu Links listing. Link: If you would like the link to lead to another page such as the My Account page or an external link such as www.google.com, specify the link here. On fail redirect to: Should a restricted group attempt to access the page, they will be sent to the page entered here. If left blank, by default it redirects to the store's "My Account" page. MetaTags: Enter any SEO (Search Engine Optimization) keywords here or use the Tag wizard to assist you in generating keywords. Page Content: This is where you will add the actual content which includes (text, images, tables etc) to the page. You can either enter the content as regular text or HTML formated content. You can also use WYSIWYG to format your content more easily. Click Save Changes when completed. Click "Add a New Page"
Click Submit, to create and add the page to the Extra Page listing. 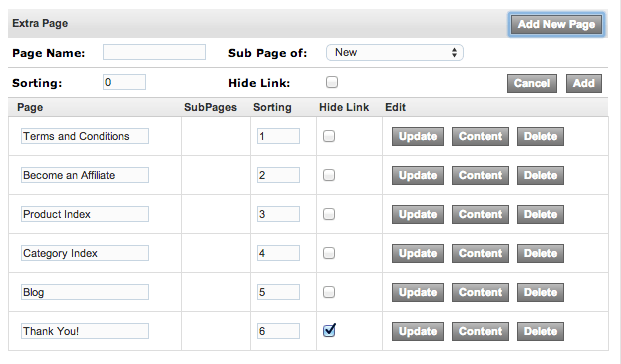 Use Database Feed: Mark this checkbox if you'd like to have the page's content controlled via a database feed. Please review our Database Feed article for more information on this topic.